The best fishing I have known for years. Payo Aegis 110, can £10 buy a decent lure? Where is the best sea fishing in the UK? My answer to that is simple, it has to be the waters around Portland and Weymouth. Yes Chesil Beach can be a fantastic venue for shore fishing, but Portland has to be one of the best Rock fishing marks in the country as well. It certainly is for Wrasse and in the right conditions the same can be said for Bass. Sometimes I become so preoccupied by the fantastic shore fishing I sometimes forget why Weymouth has the largest charter boat fleet in the country. There is a reason why for the past month we have been host to back to back competitions including the Weymouth and Portland festivals, as well as some of the largest boat fishing competitions in the world, not to mention the World Championships which are entering their final day today. I don’t want to jinx anyone at this critical stage of the competition, but England are neck and neck with Italy going into the final day of the adult competition, which makes it pretty exciting. Even more exciting is that two of the under 21 team are local lads, Jordan Davis and Ryan Casey, both are crewmen on local charter boats. I wish them both the best for the last day. Go for it lads, we are all proud of you. So lets have some pictures of some of the recent catches ,and I will start off with an epic failure by one of my friends and top charter skipper Paul Whittal, owner of Offshore Rebel, which is currently one of the boats hosting the world championships. 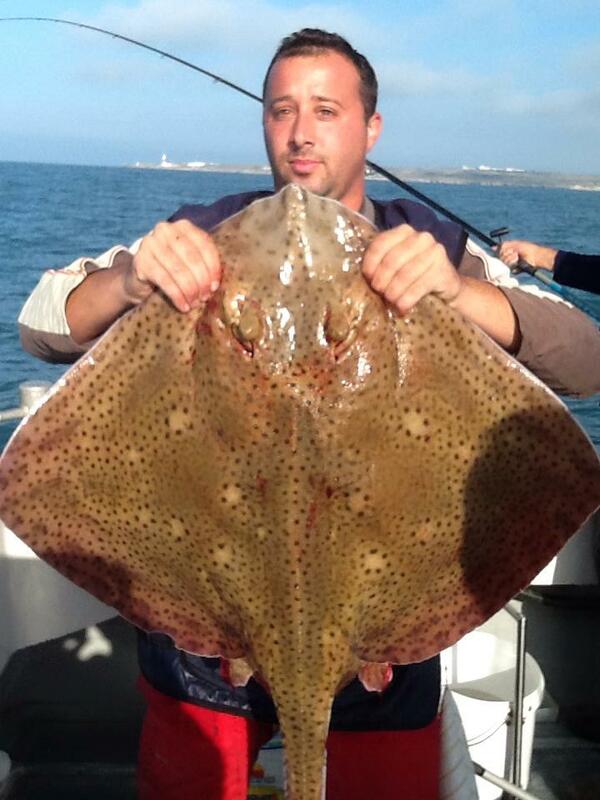 He was supposed to get amongst some Plaice and Bream, instead he messed up and ended up forcing David Bajlo from Croatia into a battle with this 20lb Blonde Ray. Strangely David doesn’t seem to upset. 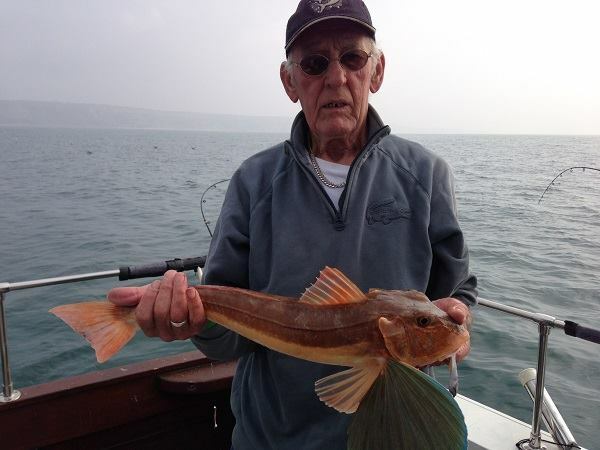 It was good to see Ian Weeding, an angler I regularly compete against in the Weymouth boat comps, catch a lovely Gurnard on Gypsy during the festivals. Skipper Trad Casey also managed to get a novice angler into one of the better Cuckoo Wrasse I have seen this year. I believe both pictures were taken by Ted Tuckerman. One of my friends has come down for his regular holiday in search of as many species as he can get in the next 10 days from the shore. So far he has managed a PB Bream of 2lb, Smoothound and Red Mullet. His main goal this time is to catch a Cod. With some pretty unsettled weather heading our way, he may well be able to get his Cod, but I am not sure how many of the summer species will still be around once the rough weather passes. So make the most of the next few days fishing. I mentioned earlier in the week that I would try and persuade local angler Fraser Monro to write a review of the new Redgill Evo Stik for us. Well it turns out that even before I had the chance to ask him, he had read the post and got straight to work on the review. I won’t include it within this weekends forecast and catch report as it deserves it’s own space, so it will feature it next week. Chesil Beach forecast: Nice calm conditions on Chesil today, but that will all change tomorrow with some stiff NW winds that will increase the size of the waves and swell. This is likely to make conditions ideal for Bass. It may make it difficult to cast into a a head wind, so species like Bream may be harder to target. Portland: Good conditions for Wrasse today, but as with Chesil the chance of picking up a Bass on Saturday will be increased. I will be having a go with lures, but large baits will also give you a good chance of a decent sized autumn Bass. Portland Harbour: When the wind picks up then the harbour will be a good mark to get some shelter. Weymouth Bay: Some nice Pollock and plenty of Garfish being caught from the piers. There are still Mullet in the harbour, but they are slowly moving into deeper water now. Preston will be flat calm, so less chance of a Bass, but plenty of chance of Dabs and Flounder. 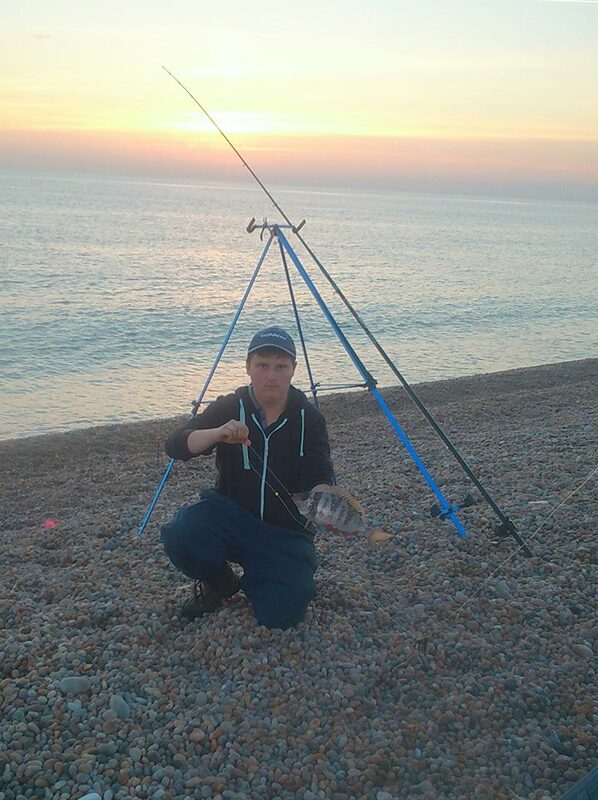 2 Responses to "The best sea fishing in the UK has to be around Portland & Weymouth"
Wouldn’t argue. Successful comps, championships, and local youngsters representing country all underline the importance of harbour frontage for WAS. Old hat I know – knocking down club for car parking – but anyone know council logic in allowing Rendezvous nab half a dozen valuable car parking spaces for tables and increased frontage. More council logic. Have you visited your thin lip swim recently Sean. Trouble landing fish now thanks to railings.